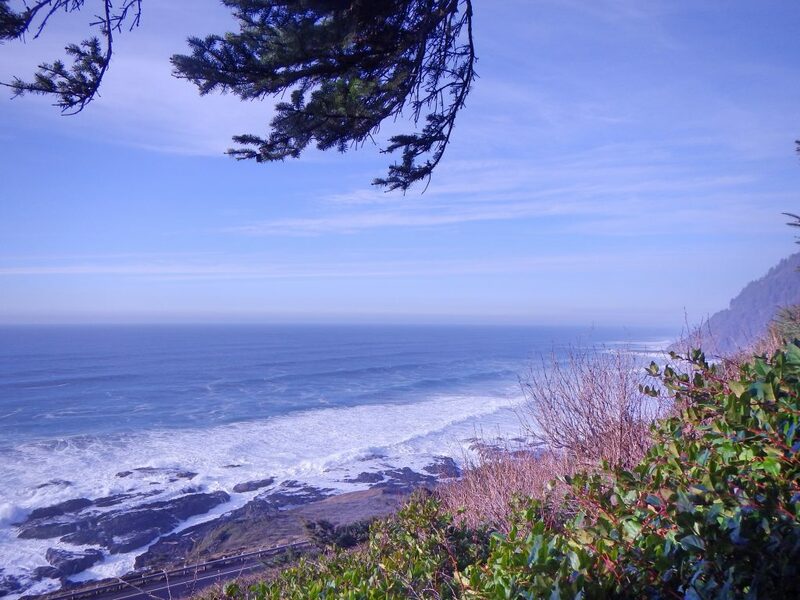 I spent the day at the Oregon coast hiking as many trails as as I could in the Cape Perpetua Area. I wanted to cover these hikes for Outdoor Project in the most efficient way possible. Plus, it was a gorgeous day on the coast! 3 mi. | 750′ ele. gain | 1:45 hr. 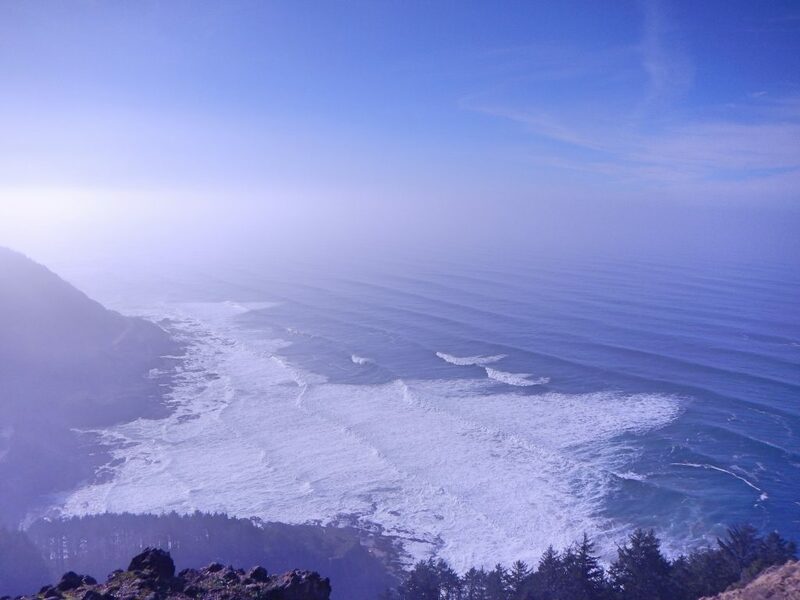 I pulled up to the Cape Perpetua Visitor’s Center at a lazy 11:30 am. Since I was on assignment, I took photos of all the signs that I could find. There were a lot. My favorite signs were the ones identifying the various trees near the building. That is how I learned to look for Sitka spruce. There would be many along this trail. Once I had my fill I began heading up the St. Perpetua Trail. 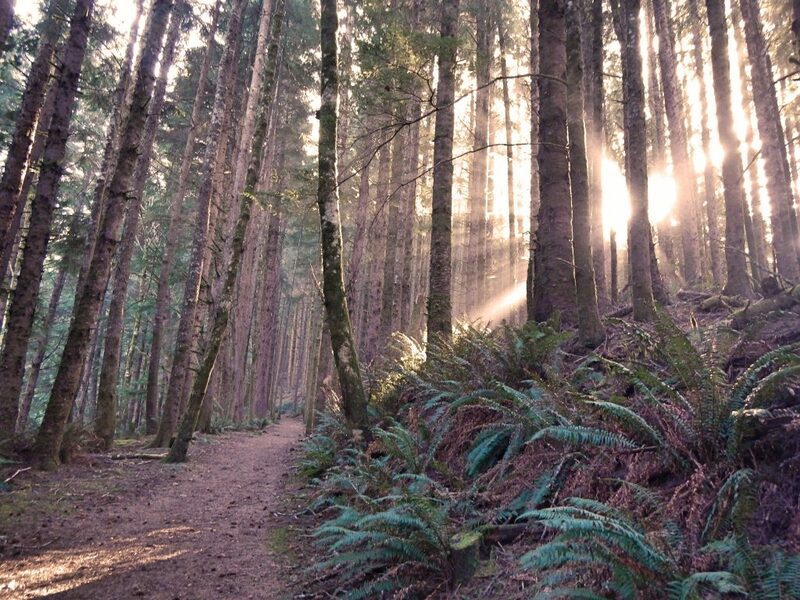 Sunlight shone down in beams of brightness through the tall trees. Massive old growth relics were surrounded by younger trees that looked like twigs in comparison. 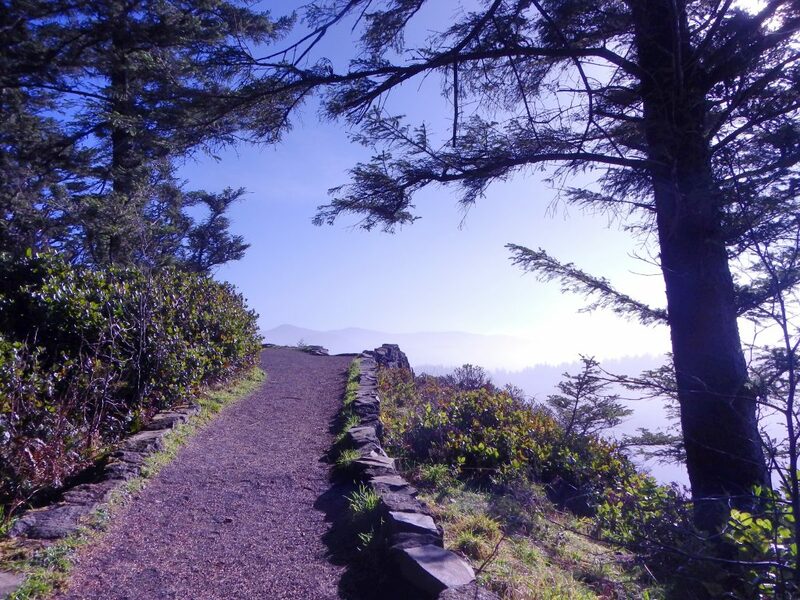 The trail climbed up through a series of switchbacks and stairs to views of the ocean. Waves rolled towards the shore in a regular cadence and white foam churned from the edge of the water well out into the ocean. The wispy clouds in the air helped to create a color gradient from sea to sky that made the two nearly indistinguishable. At the upper viewpoint, a platform edged with a low rock wall provided visitors a place to gawk at the surreal scene. I hadn’t seen anyone walking up here but since there was a parking area close to this spot, it was filled with tourists who had just pulled up in their car. I took the fun way up! 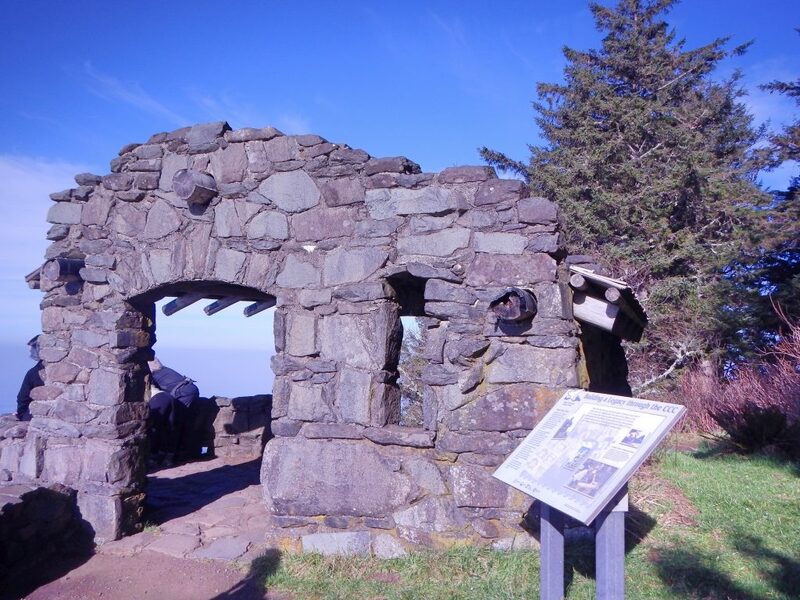 A short hiking loop brought me to an old stone shelter built by the Civilian Conservation Corps in 1934. More people were enjoying the sunny views from here. When I had my fill, I completed the loop and walked back down to the Visitor’s Center, enjoying the trees, ferns and greenery on my way. 7 mi. | 1200′ ele. gain | 2:30 hr. Next I set out to hike a longer, quieter loop. But then I came across the Discovery Loop, a short diversion along my route. I stopped to read all the interpretive signs that laid out the story of the forest like a detective book. What can we learn from the things we notice? Beautiful illustrations accompanied the well-written and creative text. I wondered what the inspiration for this sign series was and who was involved with making it happen. It was unique and wonderful. Then, I wondered, how many people stopped to appreciate these signs. I actually learned quite a bit from the signs. And I enjoyed the thought that went into putting them together. I continued on, a newly minted forest detective, looking for interesting things along the trail. I noticed that the roots at the base of the trees looked like octopus arms. And that the thick canopy did, indeed, prevent much besides sword fern to grow among the big trees. Shelf fungus sprouted from the thick trunks of the trees and thin beams of light struggled to penetrate through to the forest floor. It was a delightfully serene forest landscape. Just me, the trees, the ferns and fungi. 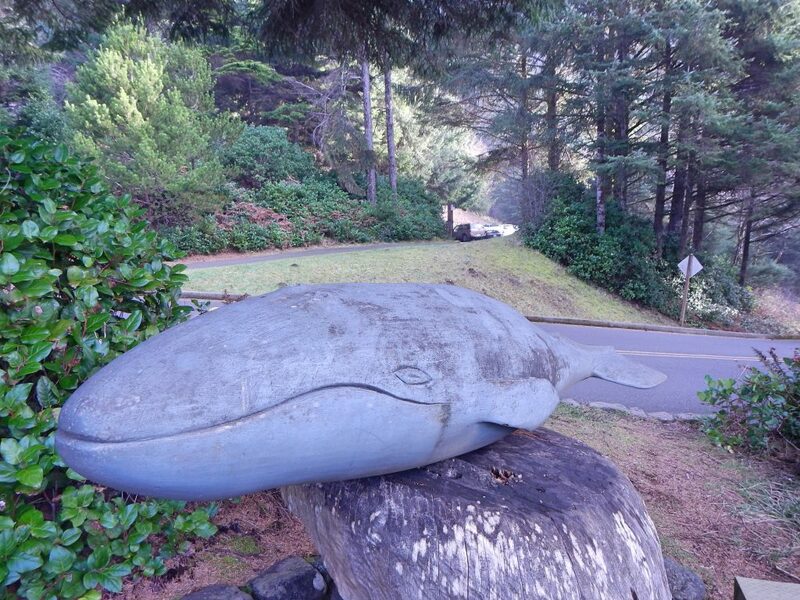 Near the end of the loop, I began to hear the ocean. Then I caught some peek-a-boo views. It was so bright and pretty outside! It almost made the walk in the forest feel like being indoors. What a cool spot with lots of trails to explore! I didn’t even get to see everything. 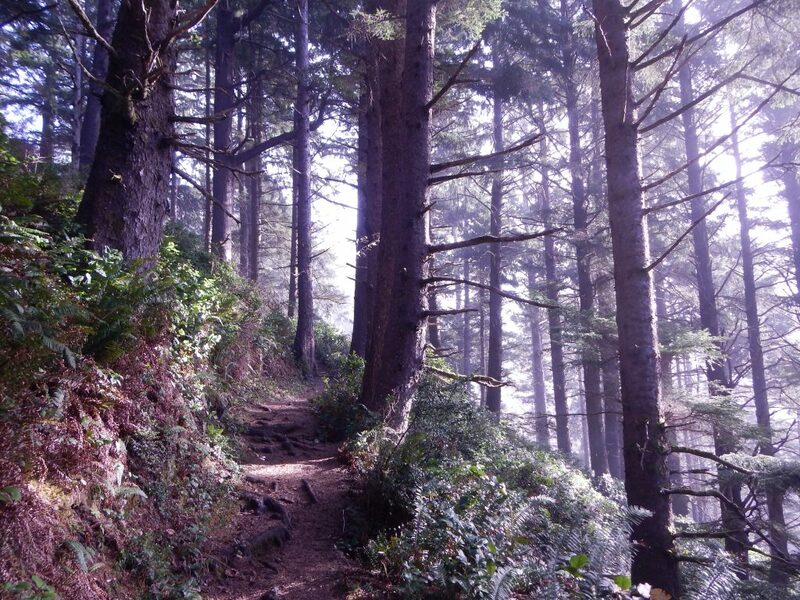 This entry was posted in Hiking, Oregon and tagged hike366 on January 19, 2014 by Jess B.